William Cobbett famously called London "the great Wen," though in the early 1820s he had a seed-farm and plant-nursery just where Kensington High Street tube station is now. How would he have felt about the city’s massive expansion in the Victorian age? Yet this was also when it became a great world city, the hub of empire and of Western culture. Rosemary Ashton and Lee Jackson both convey something of its extraordinary buzz at this time, but in very different ways. Ashton focuses on John Chapman, the radical publisher (no relation of Edward Chapman of nearby Chapman and Hall’s), at his home and business premises on the Strand; while Lee Jackson juxtaposes snippets from a variety of diaries, journals, memoirs and so on to give a first-hand feel of what daily life was really like in the metropolis then. Both books are a treat for the enthusiast, but the specialist will be particularly grateful for Ashton’s insights into the intellectual milieu and ideological maelstrom of the late 1840s and early 1850s, and the crosscurrents which fed into these from the most progressive thinkers in America and Europe. As well as being London’s main shopping street, the Strand was still the centre of the newspaper and magazine publishing industry when Chapman, son of a Nottinghamshire chemist, relocated to it in 1847. In this most richly historic of all London settings, the one-time apprentice watchmaker and medical student not only published controversial books and The Westminster Review with its heterogeneous stable of outspoken contributors, but ran a ménage as unorthodox as his opinions, with his long-suffering older wife Susannah having to put up with a series of female lodgers who, like the governess/mistress already a part of their household, were far more his equal in intellect. The best known of both his professional and personal relationships was with Marian Evans, the rising star who would be better known later as George Eliot, with the result that the one earlier book on Chapman is by Eliot’s biographer and the editor of her standard Letters, Gordon S. Haight. Ashton has uncovered much more about Chapman than her predecessor, both in his role as Eliot’s early mentor and a facilitator of revolutions in thought, and as a personality in his own right—an unfaithful husband, admittedly, but "an individual of extraordinary enterprise and persistence" (299). In Chapter 1 ("Adventurous Publishing: Emerson, Strauss, Newman [1844-8]"), Ashton explains that Chapman was a freethinker well before his arrival in the Strand. He had taken over a bookselling business near St Paul’s from a Unitarian and Transcendentalist called John Green, having first sought Green out with a view to publishing his own short philosophical work on human nature (in the end, he brought out the book himself). As part of Green’s business, Chapman also took over the distribution of his American list, including works by his own particular hero Emerson, who would later make 142 Strand his London base. Had Chapman done nothing else but promote Emerson, he would still have been important: it is well known, for example, that it was the "presence of Emerson with his simple, unobtrusive manner and his cool ‘paganism’" (44) that pushed Clough into abandoning his career at Oxford in 1848. This was the year in which Chapman became Putnam’s London agent, an arrangement which, he announced in the Publishers’ Circular, put him in a "most advantageous position to execute orders in every department of American Literature with the greatest promptitude, and on the most favourable terms" (47). By 1849 Chapman had 140 books on his list, most of them still reissues of American books. But Marian Evans had also come into his life by then, and he had published her translation of The Life of Jesus, David Freidrich Strauss’s highly controversial attack on Biblical authority, in 1846. More sensations were to come. Ashton’s second chapter deals with the furore surrounding J.A. Froude’s Nemesis of Faith in 1849, and also shows how various the face of Victorian radicalism was, with people like Carlyle, Frank Newman, G.H. Lewes, Charles Kingsley, James and Harriet Martineau and many more all revolving in Chapman’s orbit. He was in an ideal position now to embark on a further publishing venture, and Chapter 3 moves on to 1851, when he took over from William Edward Hickson a journal originally founded by Jeremy Bentham and John Stuart Mill: The Westminster Review. To the disgust of Chapman’s wife and mistress alike, an admiring Marian Evans became his first editorial assistant. As the biographer of both Eliot and Lewes, Ashton is ideally qualified to deal with this period of Chapman’s life, when (for example) he published Herbert Spencer’s Social Statistics (1851), and managed to get Mill himself to contribute to the October 1852 issue of the Review. Now, "by the causes he took up, the books he published, the authors he enabled," Chapman was really "making changes happen in the intellectual life of Britain" (xiii). One of Chapman’s causes is dealt with in Chapter 4, "Radical Reviewing and the Battle of the Booksellers (1851-2)." The Booksellers’ Association had clamped down on trade discounts, and, when Chapman contended that this did not apply to his American list, encouraged a boycott of him. Chapman’s pamphlet, Cheap Books, and How to Get Them, takes a strong stand on free trade in books, something which he hoped would benefit the readers as well as himself. This won him the support of Gladstone, Dickens and many other big names. But his success in this particular cause hardly improved his own financial situation, and he was reduced to serving customers in his own bookshop. Ashton’s next two chapters detail his valiant struggles to keep the Review afloat and uncompromised, against pressures from within and without. Although he was forced to vacate 142 Strand in 1854, Chapman continued to edit it for another forty years, right up until his death. By then this tall, striking and always energetic man had taken up medicine again and moved to Paris. Ashton’s concluding chapters (7 and 8, "Chapman’s Radical Women" and "Dr Chapman and Friends" respectively) have their own interest, particularly as the former included, over the years, not only George Eliot herself but her younger friends Bessie Rayner Parkes (author of Remarks on the Education of Girls and the activist Barbara Leigh Smith (later Barbara Bodichon). For some readers, indeed, the chief interest of the book will be in the new entries it gives into George Eliot’s life and circle. As Ashton herself adds, his life is yet another example "of what could be done in the Victorian period, when rapid changes were going forward, and a man like Chapman was able, despite the obstacles, to make a difference" (299). Sometimes it seems anything was possible in the London of that time, a feeling clearly shared by Lee Jackson, author of some popular Victorian murder mysteries, creator of the Victorian London website, and now compiler of the Dictionary of Victorian London. This pleasingly pocket-sized anthology earns its title by adopting the straightforward alphabetical organisation of Charles Dickens Jr’s original Dictionary of London (1879), and reflects the capital’s amazing diversity. Starting appropriately enough with "A is for Advertising" (an 1887 cartoon from Punch about the "nuisance" of billboard advertising, showing that the age of mass media was already upon us), it picks its way through all sorts of highways and little-known byways to reach, inevitably, the Zoological Gardens. These are shown through the eyes of Mrs J.E. Panton, an elderly Edwardian lady who recalls having been almost attacked by an escaped orang-utan on one of her childhood visits. Whatever its dangers, that was an era, she recalls regretfully, when Fellows of the Royal Zoological Society were more discriminating about who received the famous green entry tickets. Nowadays, Mrs Panton explains, "Council School children, and brats of that ilk" are able to enter and "disport themselves in the sacred spot on Sundays" (321). Here is a good example of the democratisation of leisure during the long Victorian age—as well as the class barriers it had needed to overcome! The bookjacket of of Lee Jacksonn’s Dictionary of Victorian London. In between its A and Z, this is a sundae of a book, a rattlebag to dip into and reflect upon. Here are "Drinking Fountains" and "Driving" side by side, for instance, the former excerpted form the original dictionary itself, and mentioning "Baroness Burdett Coutts’s beautiful fountains in Victoria-park" (still there today, elaborate as ever, under the protection of English Heritage); the latter taken from an 1896 issue of The Leisure Hour, in which W.J. Gordon complains of the congested roads, especially "the blocks at the Street corners," and warns of the risk to the driver’s wrist of the "hard, dead pull of the reins" (78-9). Neither bottlenecks nor RSI are anything new then; indeed, RSI has its very own entry here, with a piece on telegraph clerks taken from another journal called The Graphic. Even the South Bank’s London Eye is a throw-back, for there is an entry for its predecessor at Earl’s Court, the gigantic late-Victorian ferris wheel visible "anywhere west of London" and said to have been a huge draw during exhibition times (112). * Meanwhile, a glance down the "narrow, evil-smelling courts and alleys" of the less salubrious parts of the town reveals many for whom a carriage ride, let alone an amusement ride, was an irrelevance (281). And, for all the efforts of the movers and shakers, such paradoxes persisted: the entry on Street Arabs, too, is taken from an account written during the last decade of the reign. A Dictionary of Victorian London is primarily a taster, but it also has some appendices which offer useful leads to the Victorian specialist. The Note on Sources, for example, reveals that that nostalgic and snooty-sounding Edwardian lady, Mrs Panton, was the daughter of the artist William Frith. The social historian is well served by notes on Victorian currency, wages, budgets and housing, which supplement a variety of statistics among the entries themselves, on quantities of particular foodstuffs sold at the Great Exhibition, categories and numbers of London tradespeople, infant mortality rates for west London, and so forth. More specific bibliographical details would have been useful (most of the letters to The Times, for example, are identified only by year, so anyone wishing to follow them up would have to resort to the Times index). But even the specialist is likely to find some surprises here, and to rejoice in Jackson’s showcasing of this fascinating city in all its daily ferment of contradictions and extravagances. *This in turn was modelled on the original ferris wheel built by the engineer George W.G. Ferris Jr. for the Chicago World’s Fair of 1893. See "Circus and Theme Park Innovations." Viewed 17 December 2006. Ashton, Rosemary. 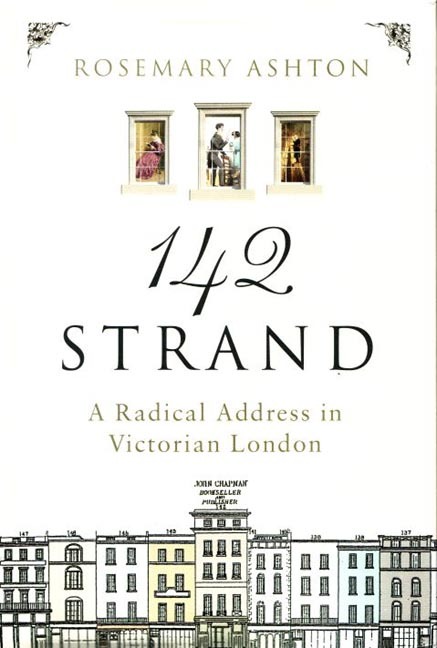 142 Strand: A Radical Address in Victorian London. London: Chatto & Windus, 2006. 386 + xiv pp. £20.00. ISBN 0 7011 7370 X (from January 2007, ISBN 13 9780701173708). Jackson, Lee. A Dictionary of Victorian London: An A-Z of the Great Metropolis. London: Anthem Press, 2006. 338 + xiii pp. £12.99. ISBN 1 84331 230 1.